A fellow coach, lets call him Dr Evil, was recently describing the fun that he was having on an Agile coaching assignment. He was tasked to work with a small PMO (thats project… or in this case Program Management Office) among a number of other teams. He put on a cheeky grin like Dr Evil and I saw that he was up to mischief. Now most coaches when faced with a PMO to work with would begin to educate those involved in the PMO how the PMO evolves to be a supportive function under Agile. Within Agile, a PMO might do a very small portion of governance and might help find resources for certain roles such as a supportive Project Manager, but the concept of a ‘reporting’ function would no longer exist or is simplified to such an extent that only a small number of resources are required. Dr Evil is not like most coaches. This is a fact that he prides himself on. Some coaches are supportive, some are direct. Dr Evil likes to think out of the box . Problem of context: this PMO wanted to have a large degree of say as to how the Project Managers in the Program should be running their work. This behaviour was very anti-Agile, directly reducing the empowerment that the Project Managers should have. Dr Evil’s solution: Load em up baby! 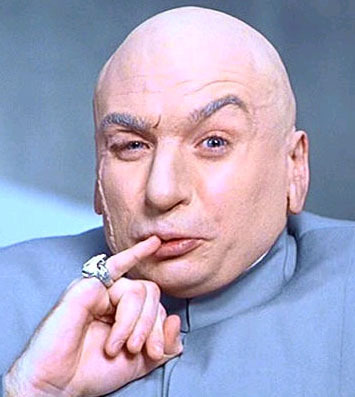 Dr Evil not only embraced what they were doing, he was actively giving them more… and more… and more. He has been happily tracking their PMO meetings and plotting on a graph the time that the meetings take. This graph is currently on an exponential rise. He hopes that at some point in time (soon) they will break under this ever booming pressure and plead for the Project Managers to make decisions, thus finally giving them the empowerment they should already have. The current most inane decision sent up to the PMO: desk by desk seating allocation of 80 personnel. Stay tuned to see how long they take to break, good luck Dr Evil!